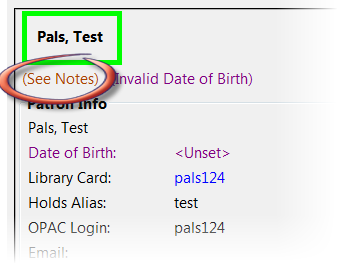 When a patron account contains a note, a See Notes message appears beneath the patron’s name in the patron summary pane. Notes are strictly communicative and may be made visible to the patron via their account on the OPAC. These notes appear in the Patron Message Center. To add a box in the Add Note window for staff initials and require their entry, see the "Require staff initials…" settings in the Library Settings Editor section. 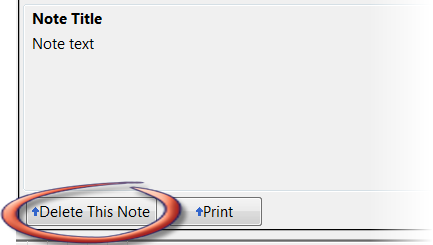 Select the check box for Patron Visible to display the note in the OPAC. 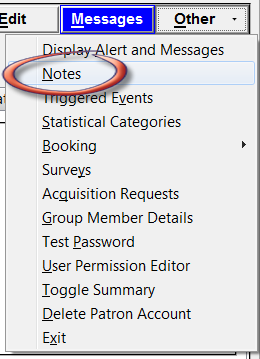 Select Add Note to save the note to the patron account. 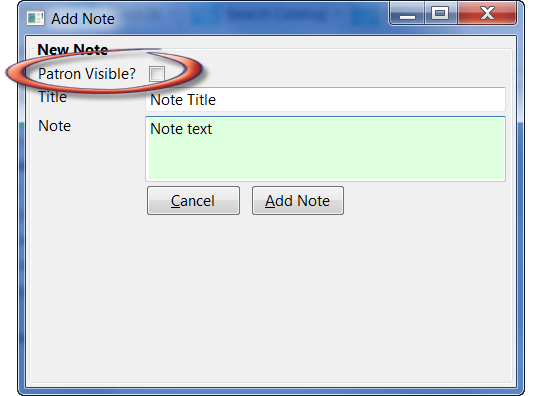 To delete a note, go to Other → Notes and use the Delete This Note button under each note. An alert will display. Click Yes to delete the note or No to retain the note. A confirmation box will display; click OK.